The important ones are the children. 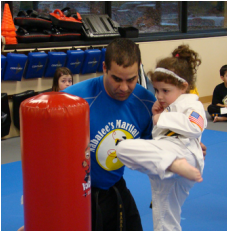 Whether you are looking for a martial arts program to teach self defense, get your child active or build confidence, we have what you need. self-protection with bully prevention strategies at the forefront of our curriculum. All programs are divided into age specific groups to help us meet the individual needs of students. A holistic approach to wellness is taught by practicing daily physical activity, learning about healthy eating and developing a positive and balanced attitude. Students work on building these and other invaluable character traits such as self control, focus and perseverance. We practice it on the mats so they can take it into the real world. We begin training as early as age 3*. At this level, children practice basic martial arts techniques. We incorporate lots of movement and stretching to help develop gross and fine motor skills, balance and coordination. Character development is paramount at this stage. Students begin to learn to focus, demonstrate self control and follow directions through fun activities. *Children must be fully potty trained and be able to complete an assessment to qualify for class participation. At this level, we continue to develop fundamental basics. Children continue to learn basic striking, kicking, blocking and grappling techniques with more emphasis on elements of our martial arts program. This training develops coordination, balance, and strength. These physical activities translate into self-respect and confidence. Once an individual has true self-respect, they are able to respect others. Our Champs begin the formal journey towards becoming a Black Belt. understanding of true perseverance and indomitable spirit. through weapons training, Demonstration Team, or SWAT team.